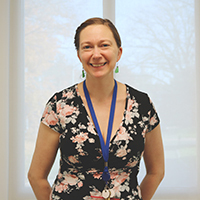 Jessica Masterson, RDN, CDE, CDN, has joined Wheeler’s Family Health & Wellness Center at 43 Woodland Street, Hartford as a registered dietitian nutritionist and certified diabetes educator. Jessica has a passion for food, nutrition and helping people understand the impact it has on their mental and physical health. She believes in the power of improving the way we eat. Jessica offers individual counseling, including a review of food intakes, eating habits, physical activity, medical conditions and medications and the development of a tailored plan to match a consumer’s lifestyle and needs. She also runs a diabetes education class to help consumers gain a better understanding of diabetes and how it affects the body and overall health, as well as an adult and pediatric weight management class, focused on helping consumers make small, gradual changes to facilitate long-term, sustainable weight loss. Group counseling also is available. Prior to joining Wheeler, Jessica was a Registered Certified Dietitian Diabetes Educator for Buffalo Nutrition and Dietetics. She also held other positions with Niagara Falls Memorial Medical Center and Top’s Cooking School. To learn more about accessing nutrition counseling services, call Wheeler’s Navigation Center at 860-793-3500.